If you are reading this, chances are you either fast or know about fasting. However, fat fasting is a little different. Just in case anyone does know, let’s go over the basics. To keep things simple, fasting is the restriction of food consumption for a period of time. However, there are several different ways someone can fast with the most common being Intermittent Fasting. Typically, Intermittent Fasting (IF) involved fasting between 16-20 hours and keeping your eating window around 4-8 hours. There are other longer variations of fasting that exist that can range from 24 hours to a full week or more! If your goal is improving body composition then shorter intermittent fasting protocols should be effective for you. If your goal is to get deeper in ketosis (maybe for medical reasons) or promoting autophagy then a longer fast may be your best option. Autophagy is the recycling of damaged cells. This process is essential to overall health and longevity. Fat fasting is exactly what it sounds like….consuming fat during your fasting window. Just like the other methods of fasting, there are reasons why this method could be useful. But can fat fasting really be considered fasting? Fasting is often considered the restriction of all food and drink that is not water. This would mean that fat fasting would not actually be fasting. However, one thing that is important to point out is that there is a difference between what a fast is and what has benefits. Here is how I like to look at fasting when considering how to obtain various outcomes. Fasting: The restriction of any foods that promote an insulin response by the body. When it comes to Keto, one of the main goals is keeping blood glucose and insulin low. This is what allows the body to burn fat and produce ketones. Research has actually shown that when fat is infused into the body, the body does not respond by secreting insulin. Based on this outlook, I consider fat fasting to be a method of fasting just like the other methods mentioned previously. I have followed fat fasting for over a year now and it is because I love the way it makes my body feel. Through self-experimentation I have found that when I fat fast with the right types of fats, my ketones levels increase higher compared to my normal fast. Fat fasting is very common and most people, whether they know it or now, follow this method. I mean have you ever heard of Bulletproof Coffee?? I like to call it Fatty Coffee! As you can see, there are several pros and cons and the which one you will experience is definitely individualized. While some people may experience better satiety allowing them to fast easier, others may experience extreme satiety that leads to chronic low calorie consumption. On the other hand, some may not experience satiety at all making this fatty coffee just lead to greater caffeine and calorie intake if not done right. 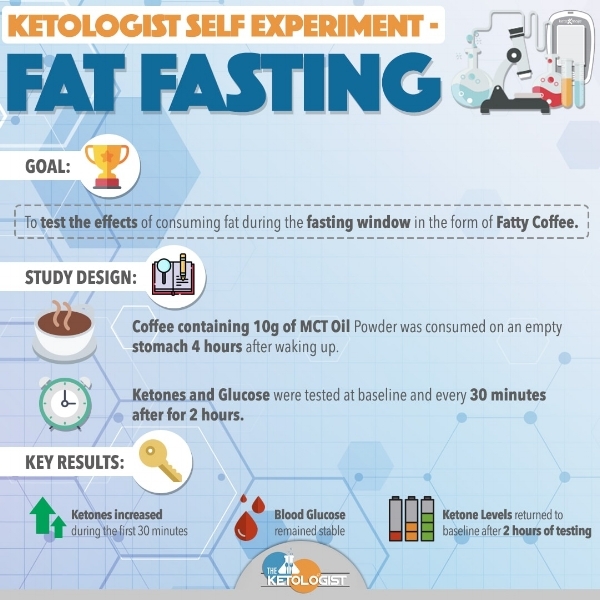 Therefore I always say, “Self-experimentation is key!” The Ketogenic Diet itself has to be tailored specifically to each individual person and so does the method of fat fasting. In fact, here is a little self-experiment I did using the Perfect Keto Coffee which conveniently contains the amount of MCTs I usually add to my coffee. 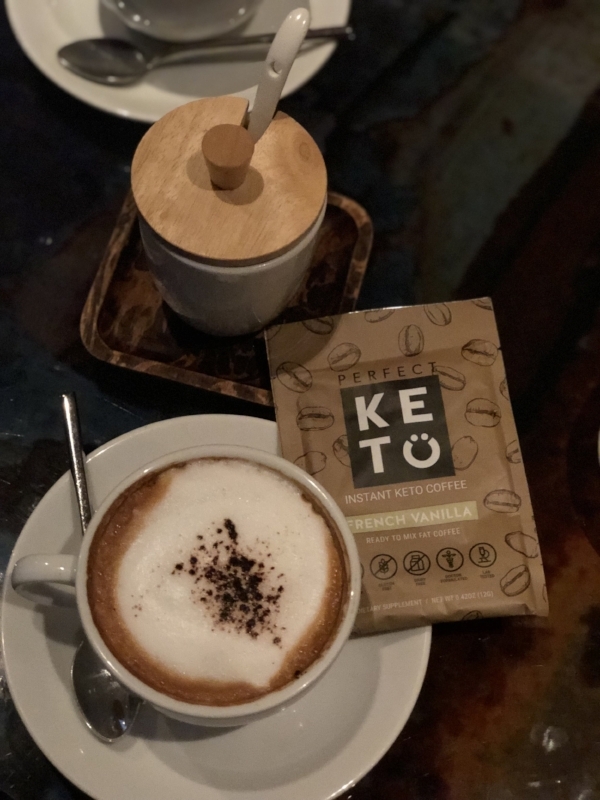 I drank the coffee and tested my glucose and ketones using the Keto Mojo Meter. Check it out below! What I found during this little experiment is that I saw stability in my blood glucose, an increase in my ketones and as always great perceived mental focus, my main reason for using this method. What Are Good Fats For Fat Fasting? I think that the best fats to consume during this fat fasting window are fats rich in MCTs or medium chain triglycerides, which is why I used the coffee selection I did. These fats are easily absorbed and can aid in the production of ketones which is why I think they are best for fat fasting. 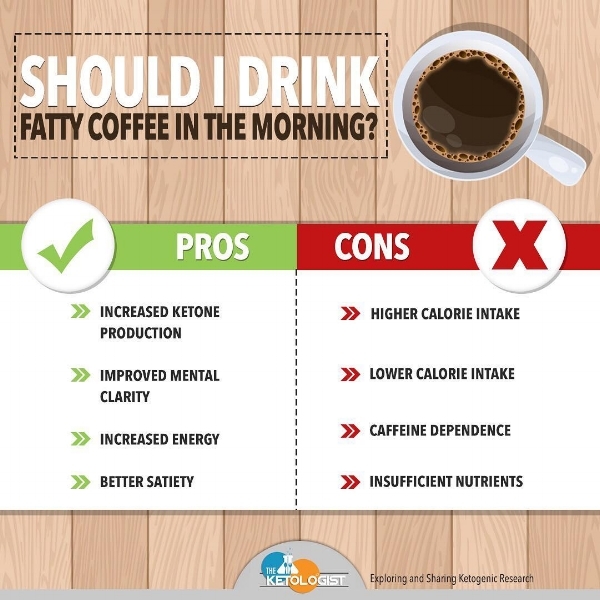 Traditionally, I have just used MCT oil during my fat fasts but now I use the Perfect Keto Coffee since it is spot on with the amount of MCT oil, its low caffeine, and it tastes pretty dang good! To sum it all up guys, fat fasting is a strategy that has its pros and cons just like all fasting strategies. I follow it because of the mental boost I get from it and if you are new to fasting, it may be a great place to start to ease yourself in! As always, self-experiment!